Do you want to change your traditional TV & LCD monitor into an intelligent platform which is just like a Tablet PC? 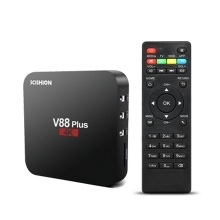 V88 Plus Smart Android TV Box is your great choice and can meet your needs because it can change your traditional TV & LCD monitor into a multimedia center by connecting the Internet (Via WiFi or RJ45). This smart Android TV Box will bring you much fun and convenience. V88 Plus runs on the latest Android 8.1 System which is perfect in productivity, stability and performance, along with various features and optimizations, delivering an improved user experience. Powered by high-performance RK3328 Quad-Core CPU, V88 Plus will be able to play 4K videos with H.265, H.264 and VP9 decoding. It also features HDR 10, HD 2.0a, USB3.0 and a Mali-450MP2 GPU. It comes with 2GB DDR3, 16GB eMMC Flash ultimately delivering a richer using experience which runs games quickly. 2.4G WiFi and 10 / 100M LAN provides reliable network. Support language: Chinese, English, Germany, Japanese, and Korea etc. 24 languages. Motivator air-mouse: Support the body feeling game, such as playing tennis, paper planes, shooting, etc.